The PW range of 'Poke' Welding guns is designed for welding thin gauge metal from one side only. The precision consoles with their accurate timers allow work on materials as thin as 0.05mm and will perform satisfactory welds on materials of up to 1.2mm. They can also be used for tack welding applications on thicker materials, where a high quality weld is not required. The smallest console, the B3, is rated at 2.5kVA and is designed for portability. At a weight of only 20kg, with a single handle designed for easy lifting, it can easily be moved around the workshop. It will weld up to 0.5mm sheet and has a seal welding facility for quick spotting on thin sheets. 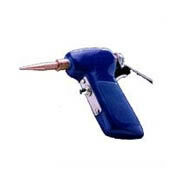 It is generally used with the PG5M pliers gun or the PG2 single side gun. 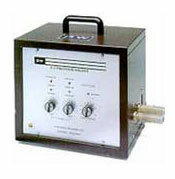 The BI2L is a 5kVA unit, designed for use on 240V supplies. The same Precision timer is used giving weld times down to 0.5 cycle (1/100 second) and stepless heat control. The B12 also has a tap switch on the transformer, allowing precise control over a wider range of welding currents. The B13H is supplied for 415V only and is the most powerful standard unit in the range. Its 15kVA transformer allows use on materials of up to 1.2mm and its additional duty cycle capacity will permit continuous work on thinner sheet. This would apply particularly to regular use for seam or stitch welding. The B13 is used with the PG2 for normal work, or with the heavier PG3 or PG3W guns for more continuous work. Specialist units with larger transformers are available to order: These would normally be supplied with hanging type 70kVA transformers for full time production use on materials of up to 1.25mm.